Today I have a severe “case of the Mondays.” I’m the only one at work, there’s not much on my agenda, and I’m freezing. However, I had a wonderful weekend in the hills of West Virginia and I’m not ready to switch into work mode just yet. So for all of us who have a case of the Mondays, I’m starting a new series called Mountain State Monday to help us ease into the work week. Each Monday morning, expect a snippet of West Virginia, whether it be a quirky attraction, natural wonder, or something entirely random that is somehow related to the Mountain State. This morning, I bring to you Honeycomb Rocks. 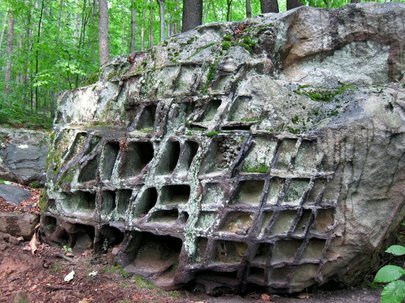 These unique rock formations are easily accessible along the Highland Scenic Highway (Route 150) in Pocahontas County. Neat, right? Although they appear man-made at first glance, the “honeycomb” shape developed naturally due to minerals, eroded sandstone, and harsh elements. Through weathering effects, the sandstone went through multiple wetting/drying periods ultimately eroding the soft sandstone, leaving the harder sandstone behind to create the formations. If you’d like to see the rocks in person, they are accessible along Route 150 via a short 1/4 mile interpretive trail leads to the impressive formations. The rock pictured above is the most complete example of they honeycomb shape along the trail.